Felted "Simple and Chic" Lapto..
First off – want to say that I feel like we named this bag quite well – just love the fact that I actually feel a sense of confidence when I carry it with me – knowing that I really don’t want to let anyone boss me around – and really think clearly about decisions that I want to make for myself. There is however a difference in my mind in actually acknowledging when you don’t know something and realizing that there is always room to learn and grow. I always think of confidence as this word that should embody how you feel and how you gain respect and ‘what you deserve’ from those around you – but there is a sense of humbleness that should be carried through as well – always understanding that there is more out there and that we can’t possibly know everything. We just want to make sure that we make the best decisions, based on what we have to work with – what we have learned so far – factual or from our own experiences and take it from there! You’ll notice that with all of our Chic Sophistic pieces – we always try to maintain a level of versatility! We want to make them ‘useable’ and really versatile. We want to make sure we add just enough pockets – pretty much always a must – and have just enough slots and openings – so that we can take not just our laptops with us, but our ipads too – or maybe a journal or calendar – anything that allows us to feel satisfied with what we are carrying around, but effortless enough to still feel like we are comfortable and fashionable at the same time. 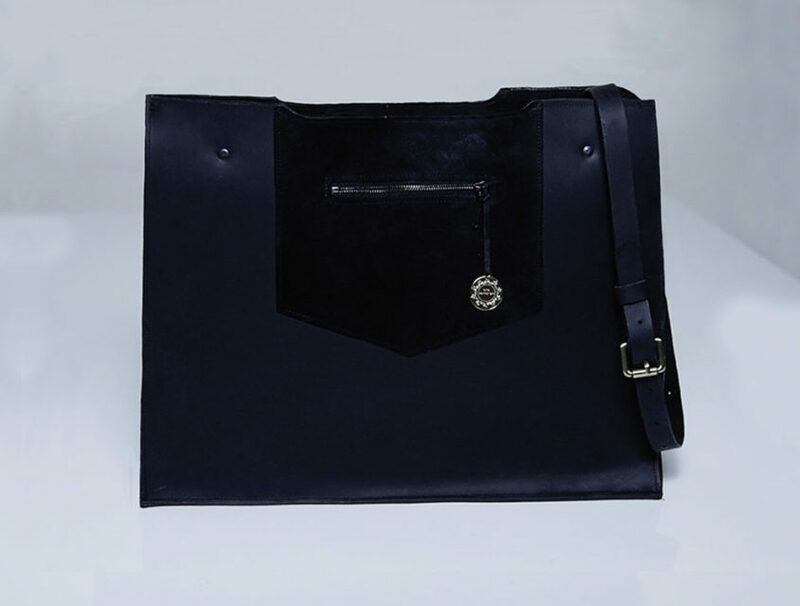 This bag is super sleek – has a really nice meshing of both leather and leather in its ‘suede’ format. I love the mixing of these two textures – as they definitely add a bit of interest and character to the piece, even though it is all black. I have sported this around the city when heading to a business meeting, and even on the weekends, when I want to run a few errands and also might stop into a cafe to fix my make up and grab a quick cappuccino – maybe sit down to work on a couple of things and just enjoy the summer breeze – this is assuming it is summer of course ;)! Can you tell I love patios, summer sun and just being relaxed with coffee in hand?